Rachel and I just returned from a vacation in Grand Bahama, and we’re both pretty wiped. The photos below we took in December of 2008 still very much reflect the native cuisine of the island, and I can assure you, we ate an awful lot of it this trip. 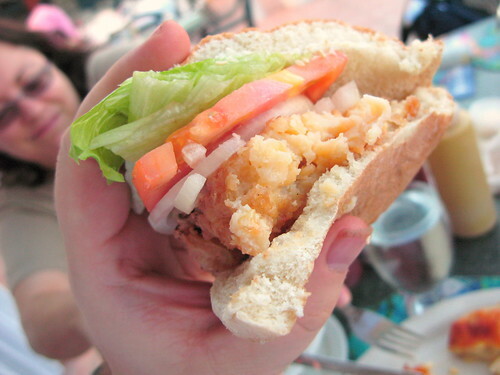 I’ll have some new photos of Bahamaian beach food (and the beautiful beaches) to put up shortly. 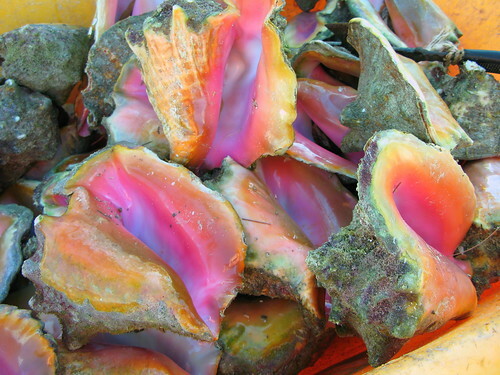 But in the mean time, feast your eyes on the Island nation’s favorite marine gastropod, the ubiquitous Bahamian conch. 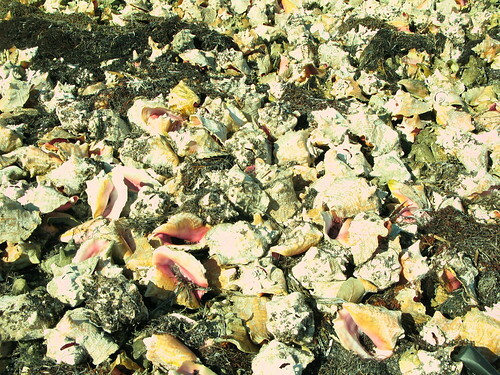 This is one of the many conch shell dumping grounds on Grand Bahama Island. There are literally tens of thousands of shells here in this one pile. 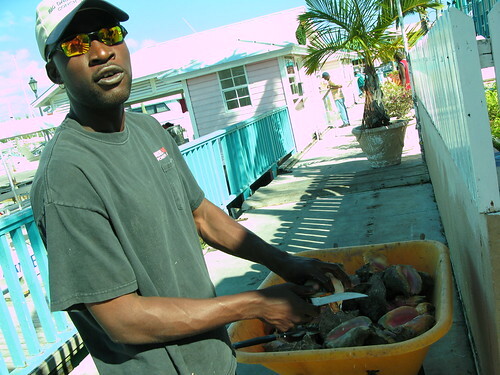 In the Bahamas, it’s all about the Conch. Click on the “Read the rest of this entry” link below for more. Conch shells, everywhere, as far as the eye can see. 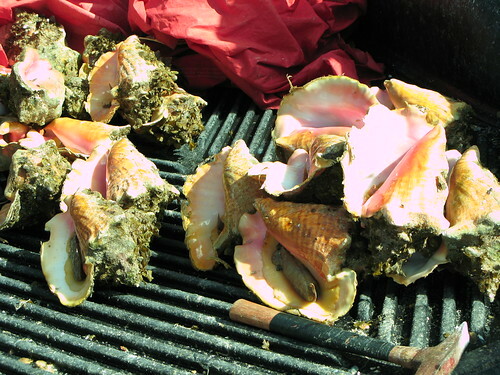 Conch are fished, naturally, by Conch fishermen. 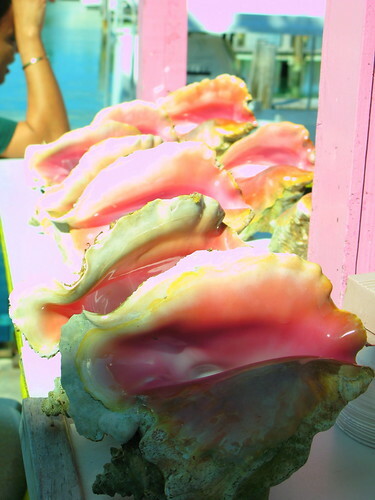 On Grand Bahama Island, you can find them all over Freeport near major roads selling conch meat which will end up in stews, chowder, fried (cracked) conch platters, conch salad and conch fritters. 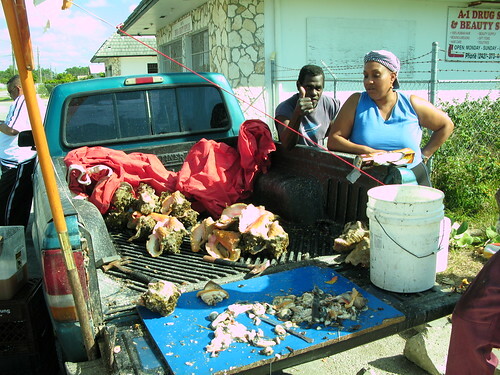 The conch are removed from their shells, cleaned and put into buckets for sale to food businesses and private citizens. 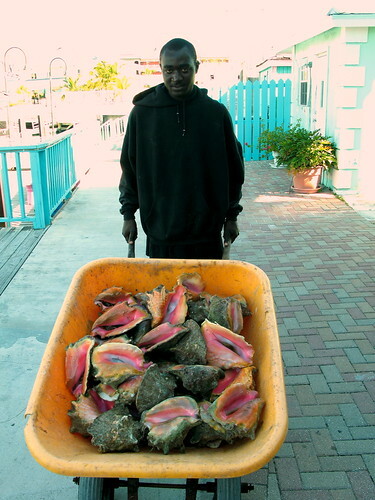 This entire wheelbarrow of conch is destined for Big Daddy Brown’s Conch Stand in Port Lucaya Marketplace, the center of tourist activity on Grand Bahama. They don’t get any fresher than this, I watched these guys come right off the boat. 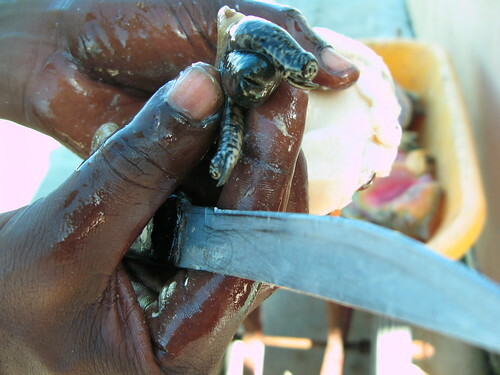 Big Daddy Brown’s cousin cleans and extracts the conch from their shells. 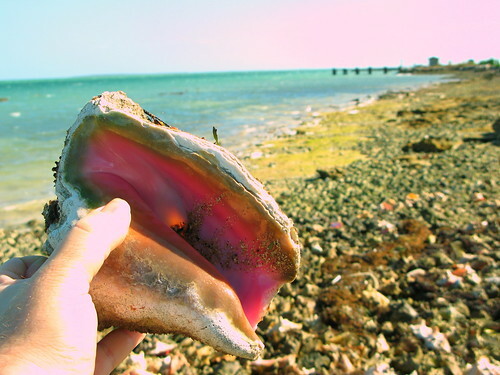 As you can see, a conch is a gastropod — in other words, a huge freakin’ snail. See his eyes? A freshly cleaned piece of conch. 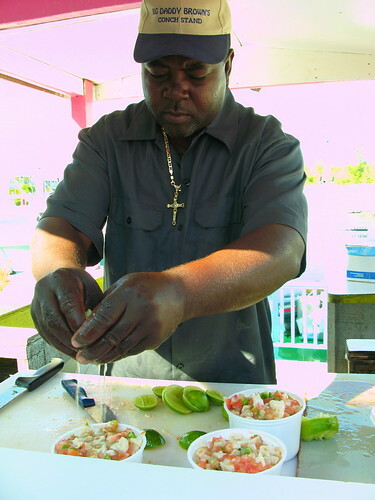 Here’s Big Daddy Brown, cuttin’ up the conch for his famous salad. 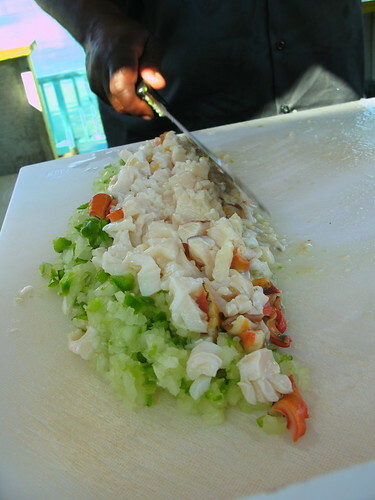 The (uncooked, freshly killed) conch is then scored and chopped. 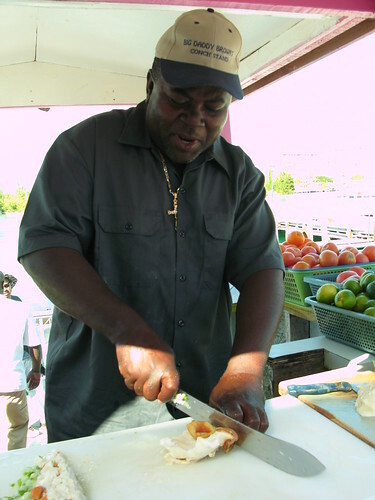 If you’re not into conch, Big Daddy also has Caribbean Spiny Lobster which he can give the conch salad treatment to. I highly recommend it. 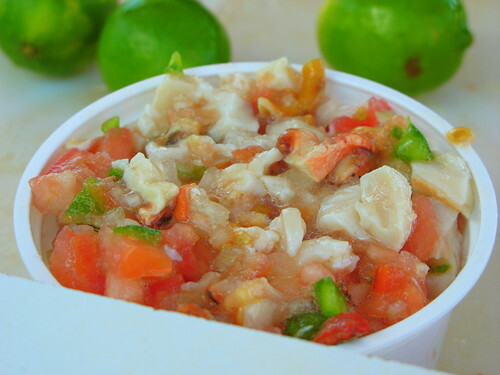 The essential components of a Bahamian Conch Salad — Chopped conch, Green Pepper, Onion and Tomato. Big Daddy Brown then adds fresh lime juice, as well as sweet orange juice, salt and pepper, and hot pepper sauce (habaneros) to complete the salad. Big Daddy Brown’s Conch salad. In my opinion one of the very best on the island, and for $8, an absolute bargain. Here’s a video I took of the process so you can see how it is done. Big Daddy also has nicely cleaned and polished conch shells for $5, which is quite a reasonable price considering what a stinky and yucky job it is to clean and wash them. 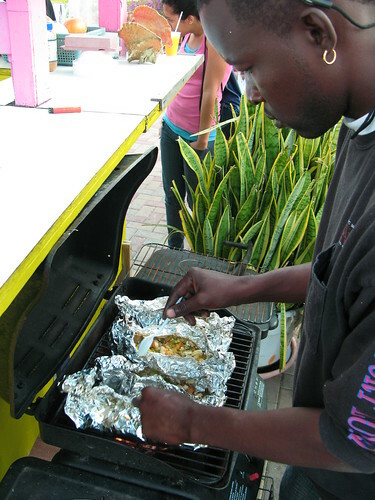 Big Daddy also makes Grilled Conch, which is essentially the same ingredients as a Conch Salad, but wrapped in foil, and cooked on a BBQ grill with butter, garlic, and plantain. 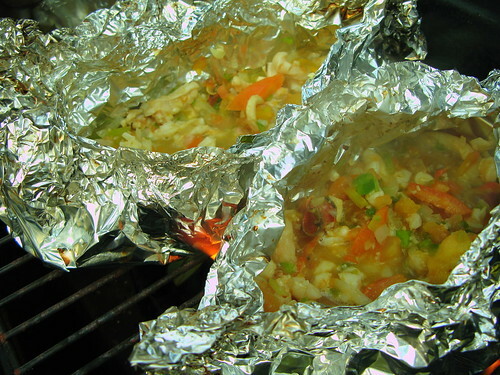 Closeup of the conch cooking on the grill. Grilled Conch. Now this is what you call REAL Bahamian food. 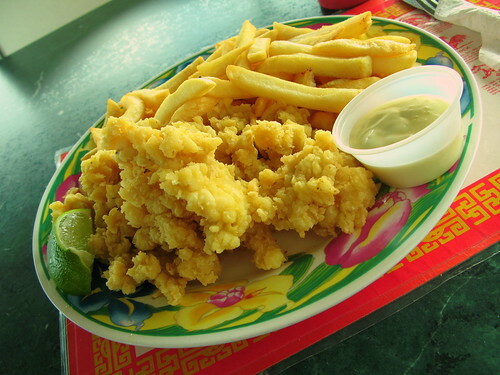 Here’s another popular means of eating Conch — “Cracked”, or battered and deep-fried. 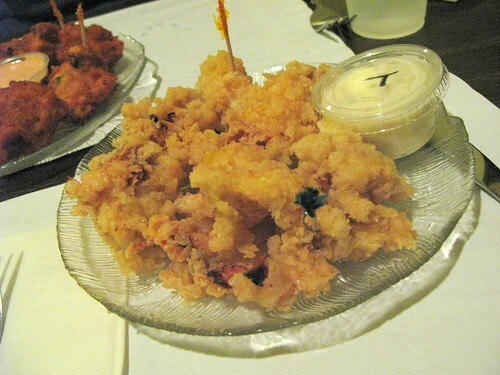 I’ d describe the flavor as a cross between a really excellent Fried Calamari and Fried Clam Strips, but much more tender than the either two. 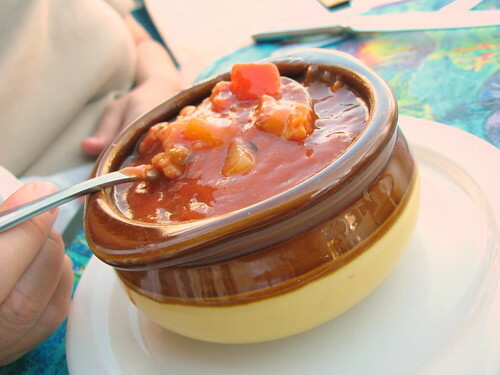 It’s addictive as hell, and nearly impossible to avoid eating at least once during a visit to the Bahamas. 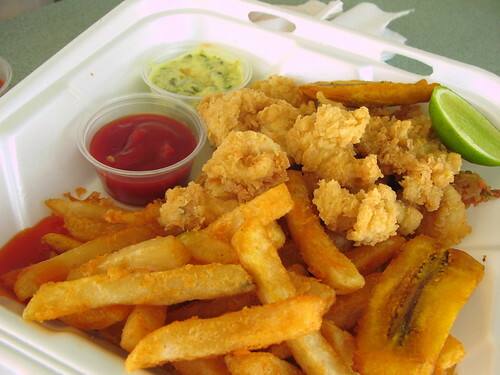 This is Cracked Conch from Bishop’s, a very popular beachside restaurant on the East side of the Island, near Lucayan National Park. 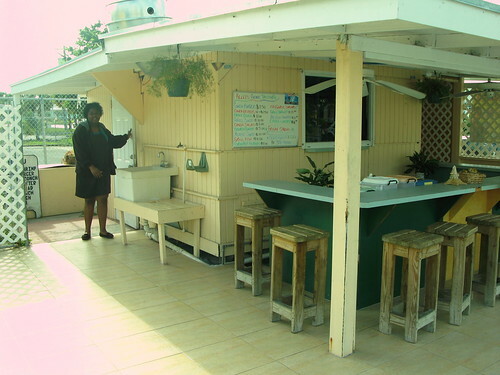 Personally, I prefer the Cracked Conch at Diamond Sunrise Bar, which is on the same beach as Bishop’s. Nice big chunks. Here’s an appetizer order at Simply Native in Freeport, a really good traditional Bahamian restaurant. 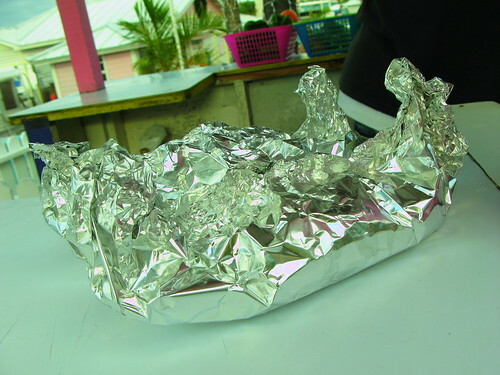 This was our runner up for best Cracked Conch on the island. 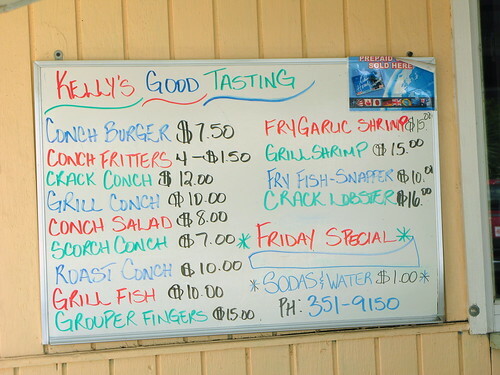 However, our favorite Cracked Conch of the week has got to be at Kelly’s Conch Stand, in the Freeport Vendor Market. 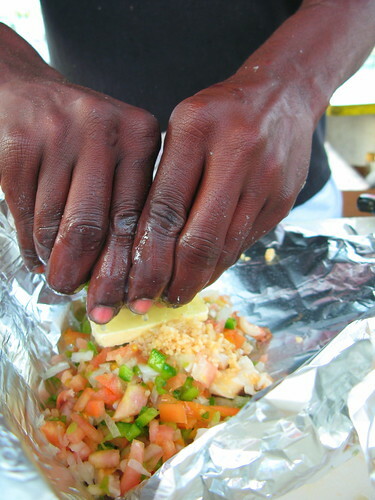 The best Bahamian food can be found in stands like this, not in fancy restaurants. 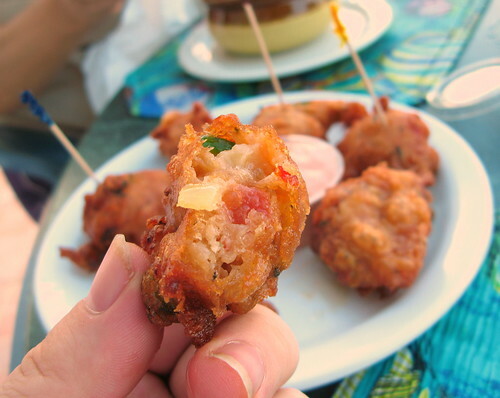 Conch fritters are another popular means of eating our favorite large marine gastropod. These are from Grouper’s Grill at the Ocean Reef resort in Freeport. And again, at Bishop’s, which we really liked. Did I mention that the Bahamian diet consists of a LOT of fried stuff? Toss the diet out the window if you decide to go native. 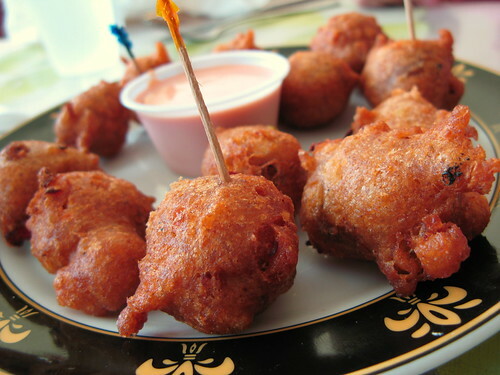 No order of Conch Fritters should be without fresh lime and Goat Pepper Sauce (Habaneros). This is simply (VERY!) 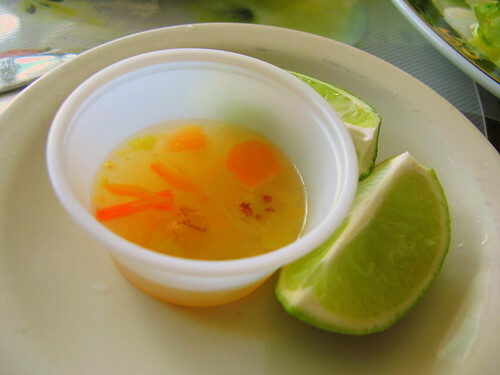 hot Caribbean peppers mixed with lime juice and salt. Simple, yet deadly. And yes, they even have ConchBurgers. My favorite method of conch consumption has to be chowder, given how much variation there is in terms of chowder recipes on the island. Grouper Grill’s chowder is decidedly tomatoey. 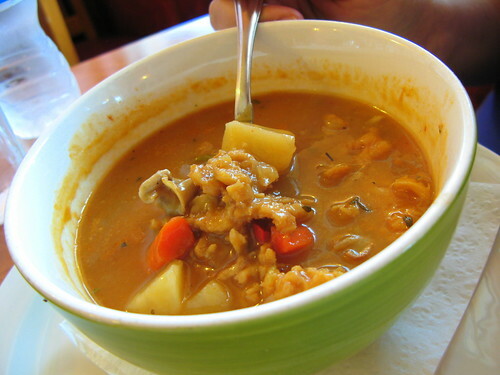 Here’s a chowder from Mary Ann’s, a traditional Bahamian restaurant that recently opened near the airport. This was one of my favorites. Here’s one from the Mediterranean restaurant in Port Lucaya. 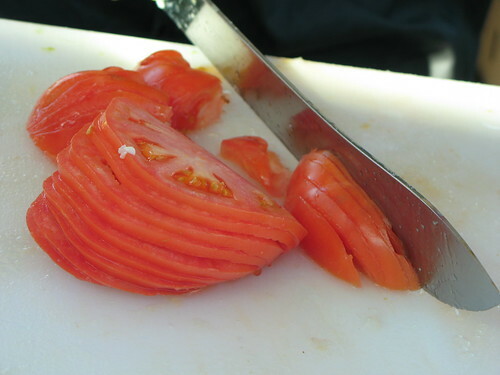 This entry was posted on Sunday, May 20th, 2012 at 3:00 pm and is filed under Food, General. You can follow any responses to this entry through the RSS 2.0 feed. You can leave a response, or trackback from your own site. You had to make NOLA look so awesome, leading my fiancee and I to take our vaycay there… dangit, do they take the Caribbean dollar or USD in the Bahamas? I truly enjoyed these photos. I haven’t been to the Bahamas in ages. I used to go all the time and stay at the Ocean Club, which I hear is now a big celebrity hangout unfortunately. I remember the Bahamas when it was a secret and it was quiet. I love your blog — and usually get to the end of your posts drooling! In general, I’m happy just lurking – but I thought I’d share a little with you about your conch. As an avid diver and lover of the sea, it pains me to see so many discarded conch shells. Yes, they are harvested in a way that does not damage the ocean habitat – but they are harvested in numbers that are not sustainable to their species. It’s nice to know that there are some regulations in place to protect conch. But I encourage you to support sustainable fishing practices by eating only farmed conch. Mouth is watering! I now want to book a trip to the Bahamas! Wow! Those pics make me miss home. That food looks sooooooooooo good! I’ve been jonesing for some good cracked conch. These pics make me want to lick me screen. Its my favorite. Sushi Conch, I love the texture. 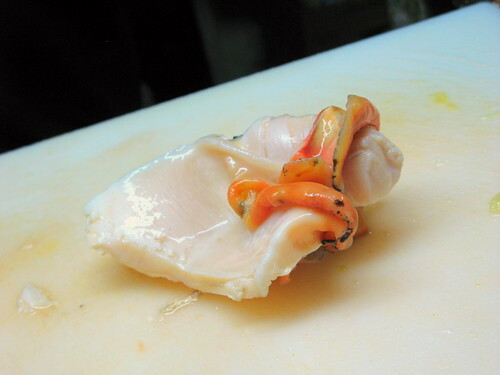 Am making cracked conch tonight for dinner in fact. Oh, forgot to say..so, you missed Latkes one year..lucky you ! 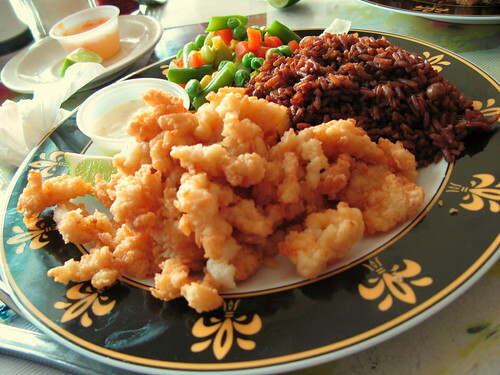 All the conch on the menu reminded me of Forrest Gump and all the shrimp menu ideas – hah! 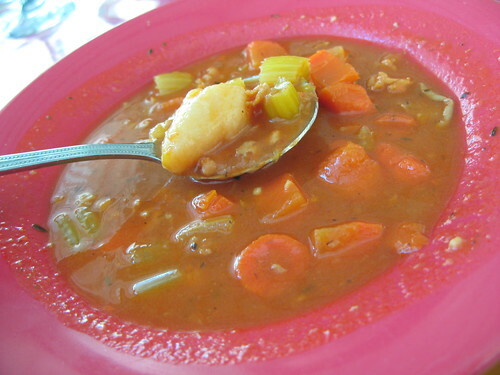 I’m trying to get a feel for the food of Bahama for my next meal – Nice post, thanks! I’m a native and I love your post. It looks like you truly enjoyed the food you had in GB. I love to see people try something they’ve never had before (and if it’s conch, be kinda weirded out by the fact that it’s a snail) and then find out they just can’t get enough. But I hope you didn’t only have conch while you were there! 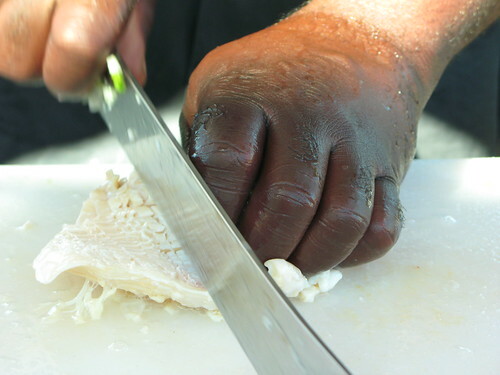 :) Personally, I could devote a lifetime journal to my passion for Boil Fish. Oh my how I love some nice boil fish n’ johnny cake. Muddo. There is nothing like it. I am from the Bahamas and I absloutely love your post! 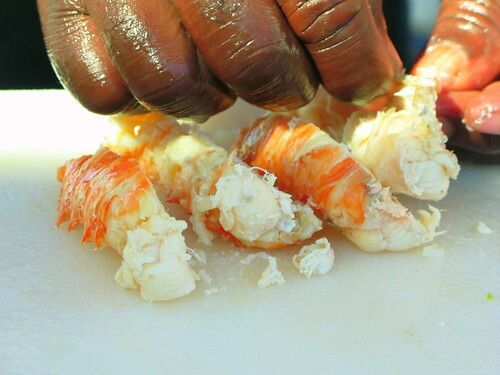 The photos and comments truly encapsulate the essence of a “conch experience” in the Bahamas. 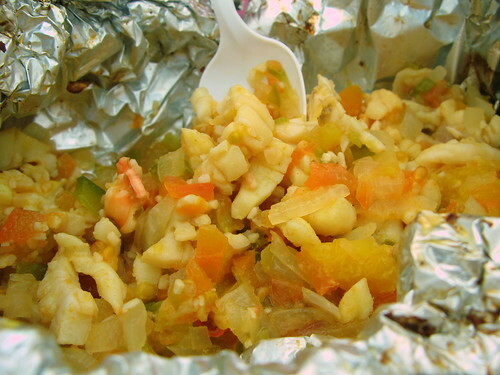 Like most Bahamians, I love all forms of conch mentioned in the post, but I also love stewed conch, steamed conch, scorched conch, conch lasagna, conch patties and conch fettucini alfredo……….delicious stuff! Again, excellent post and hope you enjoyed your visit to Grand Bahama. I could easily eat my body weight in cracked conch! In fact, I drop my bags at the hotel and make for the beach to find a fisherman frying them up on the beach and serving it on rolls with tartar sauce!! Lawdy lawd!